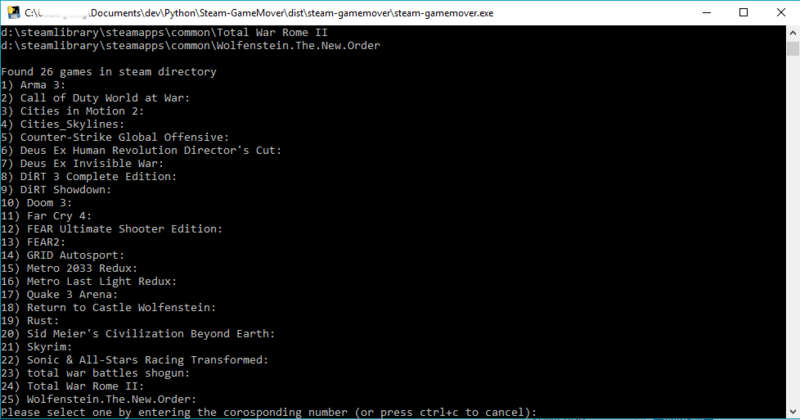 I made this simple Python program for Windows which I’ve released under the GNU public licence to fill a gap missing in Steam, the ability to move an individual game from one steam library to another. 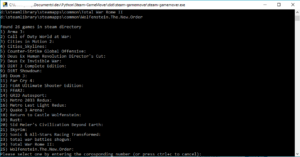 Close Steam down, point this script at your old and new steam libraries, choose the game you want to move from the list and hey presto your game is in the new location. Great for if you need to free up space on your drive but you don’t want to move your entire library to another location. Use this at your own risk, it’s only been tested on my machine and I’ve only covered a few things that could go wrong. Any assistance in improving the quality of the code would also be greatly appreciated. Download steam-gamemove.py if you already have Python 3.5+ installed, if not download the precompiled version at /dist/steam-gamemover-v0-1.zip. You may need to download and install the Microsoft Visual C++ Redistributable for Visual Studio 2015 (https://www.microsoft.com/en-gb/download/details.aspx?id=48145) if you wish to run the precompiled version on Windows prior to Windows 10. I’ve recently started playing one of the wargames called ‘IO’ hosted at www.smashthestack.org. If you’ve not heard of them before they host a number of games to test your skills at computer hacking, programming and your in-depth knowledge of how computer systems work. Each game is hosted on it own server which you access via ssh. At the begging you are provided with the username and password for level1. It is your task to complete the challenge set for you in that level. Once completed you will have escalated your user privileges to that of the subsequent level, allowing you to read a file in the next levels home folder containing it’s password. Once retrieved you can log out and back in with the next levels username and password and attempt the following challenge. Although for a seasoned pro’ the first few levels of ‘IO’ are probably considered easy they are still tough enough that significant knowledge is required to complete them. The first level consists of a program which asks you to enter a password. Depending on your input this will then either output “Fail.” or “Win” along with a new shell running as level2 privileges. The aim of this task is to analyse this executable file and extract the password string contained within. I won’t reveal the solution but one approach would be to debug the program with gdb, find the code which does the string comparison between your entry and the correct password and then to read the password stored at the memory address. The other approach is much quicker but maybe slightly defeats the point of the level as an introduction to gdb. The second level consists of a programming and maths challenge. The level2 program asks for a password which consists of the results of a range of numbers in a specified series, joined together one after the other as a string. I completed this by creating a python script to create the series of numbers needed, concatenate the appropriate ones together in to a string and to give that as an argument to the level2 executable. Win. For tasks like this you may find it quicker to do the codeing on your own machine and then upload to the io server. To do this you can use the ‘scp’ command from the terminal. (you can download scp for windows from the putty website). First create a directory in the io server /tmp folder. Give it a hard to guess unique name as although directory listing is restricted on the server and others can’t see your folder name if you use an easily guessable directory name others could still access it by chance. While logged in to the io server type, ‘mkdir /tmp/mydirname’. Replacing mydirname with your unique directory name. The command is broken down as follows, ‘-P 2224’ specifies the port number as io does not run on the standard ssh port number, ‘~/files/level2.py’ is the location of my file to upload on my machine, ‘level2’ is the username with which I want to connect to the remote machine, io.smashthestack.org is the remote server address, the ‘:’ separates the remote server address from the final part which is the location on the remote machine to store my file. I’ve just started the 3rd level and upon running the level3 program it instantly seg’ faults. Here in lies the challenge. Hopefully this should keep me occupied for a while. Here is a snippet from the ./README file you can view when you connect. Welcome to the IO wargame at the smash the stack network. You have done the hard part and found our realm. Here we allow you to play with classic, and up to date vulnerabilities in software. Since many of you may be unfamiliar with how a wargame works, we will give a quick introduction in the following paragraphs. If you are an experienced wargamer, all this will be familiar to you so you might want to skip to the last section which iterates the specifics of this game. The problems will be presented to you as a series of programs. Which will vary in size from a few lines containing an obvious bug, over to larger, and finally real software. The point is always to exploit this bug in such a way that you can grab control of the programs execution and make it do what you want. For example you will often want it to drop a shell. The way this works is that the binaries are SUID binaries (http://en.wikipedia.org/wiki/Setuid). This means in short that they run as a different user than you do. The point is to grab control of the program and make it execute your own shellcode. Which will in turn allow you to read the password for the next level. So I recently took it apon myself to try installing Python 3.1 from source code on my Mac laptop. As soon as ‘make’ had finished I was presented with a message telling me that several libraries which would be required for extra functionality were missing. One of these was ‘readline’. If you don’t know what ‘readline’ does, it provides the functionality inside the Python interpreter similar to that in Bash or Doskey. Just to mention one of the small but important feature it allows you to be able to press the up and down arrow keys to scroll through previous input. If you intended on using the Python interpreter interactively this is pretty much an essential. OS X does not contain the GNU readline library and instead uses a replacement called editline due to licencing issues. It’s been a few days since I performed the install but I hope my memory serves me correctly in detailing the steps necessary to get Python compiled and using the readline library. Please leave comments to the contrary if you believe I’ve missed out any step and I will try to plug-in the blanks. Please note, to compile programs from source on OS X you will need to install X Code from Apple. This is the Apple development environment which bundles their IDE, libraries and such along with the GNU C compiler GCC. The first thing I needed to do was to download the ‘readline’ library. I did so by downloading readline-6.1.0.tar.gz from http://pypi.python.org/pypi/readline/. Once downloaded and extracted, I opened up the terminal and navigated to the ‘~/readlin-6.1.0/readline/’ directory. Here I ran the command ‘./configure’, this checks your environment for prerequisites required for the compilation and then configures the make file for the build as appropriate. Once this has completed successfully, you should run now run the command ‘make’. Again this should be done from the terminal in the same directory as before. Your computer will now be compiling the ‘readline’ library. Presuming all steps have been successful so far you can now type, ‘sudo make install’, again from the terminal in the same directory. You will require admin permissions for this due to files being copied to protected directories. You have now installed the ‘readline’ library we have just compiled. Now that we have built and installed the library, you can go back to your Python source code folder and compile and install Python 3.1 as instructed in the Python documentation. All going well, you will now notice that at the end of the compile it will no longer complain about ‘readline’ being missing and your Python interpreter, will now work as intended with the correct functionality.